Muirfield is one of the nine golf courses that presently host the Open Championship. But there are more than 2,500 courses in Great Britain and surely some of the others are good enough to host one of the world’s leading golf events, no? A very definite “yes,” according to the writers at The A Position, the web’s top site for golf and travel. There are many—very many!—outstanding courses that would give the world’s best golfers a stiff challenge. The members of The A Position were polled for their pick of the best course to never host an Open Championship, an important distinction as it forces out great past venues such as Scotland’s Prestwick, England’s Royal Cinque Ports and Prince’s, and Northern Ireland’s Royal Portrush. The A Position’s suggestions—a brilliant baker’s dozen—are a quirky lot, spread across Britain and into Ireland. But they have a few things in common, most notably that they are all on water and are true links or links-style courses, just like the courses in the existing rota. It is the writers’ belief that only a true seaside layout is a proper test for such a venerable championship. Something else they all have in common? They can all be played by the traveling golfer (with some advance planning, of course). And according to The A Position, are experiences not to be missed. Maybe the world’s best golfers will be so lucky—some day. 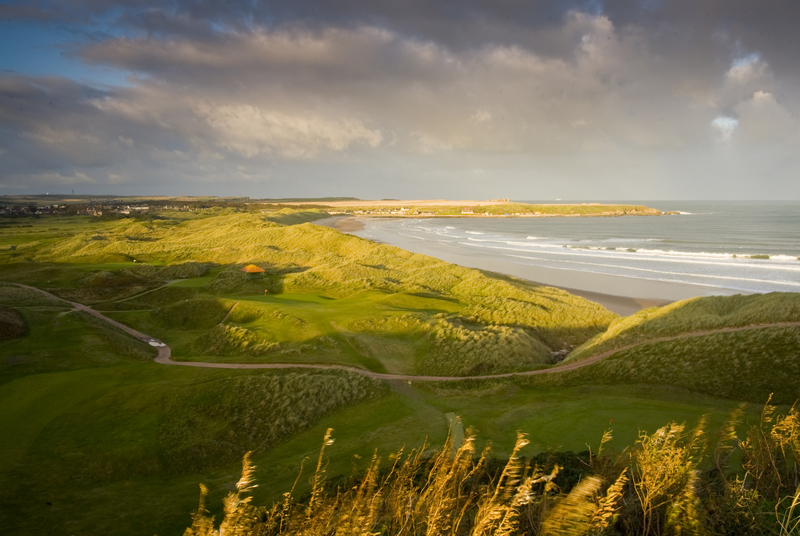 Cruden Bay (above) is not merely the most gorgeous, if relatively unknown, golf course in the British Isles capable of hosting an Open Championship. Rather, Cruden Bay is plainly and simply the most magical golf course in the world that somehow remains almost totally unfamiliar to even the most ardent golfer. Its anonymity results not from its newness, as golf was played in the village of the same name as early as 1791, and the links was originally designed by Old Tom Morris and opened in 1899. Instead, part of Cruden Bay’s charm comes from its secluded locale 23 twisting miles from Aberdeen near a sleepy town called Aberdeenshire that is nearly as challenging to reach as it is to say aloud. Yet those who make the homage discover a masterpiece that quietly meanders in a figure eight along the North Sea through massive sand dunes veiling one brilliant hole from the next. Only there can one fully appreciate how the distant outline of Slains Castle provided Bram Stoker’s inspiration for “Dracula;” and why Pete Dye calls Cruden Bay, along with Prestwick, his favorite in Scotland: Mystery with a splendid mix of architectural wonder. Since it is too hard for me, it should be just right for the good players. But seriously, while Royal County Down makes everyone’s Top 10 in the world list, from an architectural point of view it is surely number one. It requires you to actually hit all kinds of differently shaped shots, something few courses ask—high, low, left to right, and vice versa. It also requires accuracy: When caddies say hit it over the aiming rock on the many blind tee shots, they mean over the rock, not a yard right of the rock. “Pretty good” shots don’t work here; good ones do. There’s really nothing like it in golf. 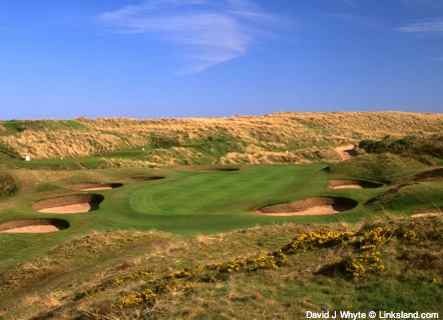 And it doesn’t hurt that it is epically, stunningly gorgeous, with long coastal exposure, towering dunes, views to the Mountains of Mourne, and, in season, the course is alive with purple heather and blazing yellow gorse. There is a reason why almost every other great course has a painting of RCD hanging in its clubhouse. I know what you’re thinking: Anything done by The Donald, least of all in his distant ancestral home, can’t be worth a dime, much less the Open Championship. But on a spectacular site boasting some of the biggest dunes in Britain, Trump gave third-generation architect Martin Hawtree carte blanche to fashion a stunning, grand-scale links with a view of the sea from nearly every hole. Trump International Golf Links is tucked away in Scotland’s northeast corner, the Aberdeen area known for its fierce winds and gloomy weather. But no matter. Trump’s 2,000-acre development has plenty of room to accommodate a major event. The layout itself, stretching to over 7,400 yards and parted through massive, bearded dunes, is as daunting as any links on the Open rota. Trump may not live long enough to see the Claret Jug hoisted at “the world’s greatest golf course,” as he calls it, but this epic links is more than good enough to test the world’s best players. First, the Open Championship should always be played on a links course in Scotland, where the game began; forget these polite and political nods to heathland and parkland layouts in England or Wales. Second, the course should be at least 100 years old, since the event itself is more than 150. Last, to prove that modern technology has not tamed the elements of sand, sea, wind, rain, and fescue that make Scottish golf the ground-loving game that it is, the event should be staged on a course that’s old-school in length, which is to say under 6,000 yards, and in a locale where the ocean breeze could blow hawks out of the sky. So what if the pros shoot in the 50s, and what could be more fun to watch? 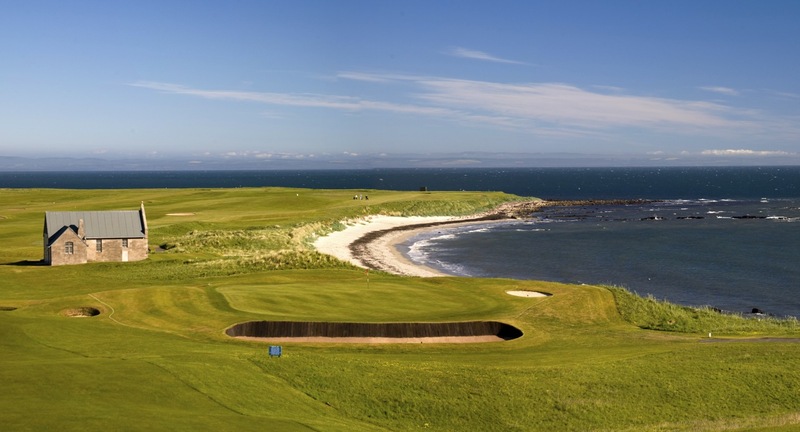 All of which points to The Crail Golfing Society’s most excellent and demure Balcomie Links (above)—laid out by Old Tom Morris in 1895, and located a few miles up the road from St. Andrews—as the most likely candidate. Infrastructure such as hotels and restaurants are already in place at the nearby Home of Golf, there’s plenty of room for parking and staging on Crail’s second golf course, and Balcomie’s signature stone boathouse will look brilliant as a logo. “It doesn’t overawe you with its length. It supplies plenty of gorseless Lebensraum to err in. It keeps you on your toes by making it clear from the outset that it rewards only shots that have been well thought out and well executed. And it encourages you to hit decisive shots by providing vigorous, close-cropped turf, on which the ball sits up beautifully, and very true greens, which are a joy to putt. In a word, I found Dornoch (left) all I had hoped it would be—a thoroughly modern old links with that rare equipoise of charm and character that only the great courses possess.” Herbert Warren Wind wrote that in 1964. Nothing has changed but the breadth of Royal Dornoch’s renown. Golf Magazine ranks it #15 in the world. Tom Watson went there to play one round after winning the 1981 Open, and stayed for 54 holes of “the most fun I’ve ever had on a golf course.” Donald Ross learned the game there. If it is too far north with too-iffy weather for the R&A to bring an Open, it’s the R&A’s loss, and golf’s. Imagine a spectacular expansive 20-hole Irish links course with plenty of muscle designed by veteran golf writer Pat Ruddy. Opened in 1993, this test has been lovingly refined since. That would be The European Club (left). 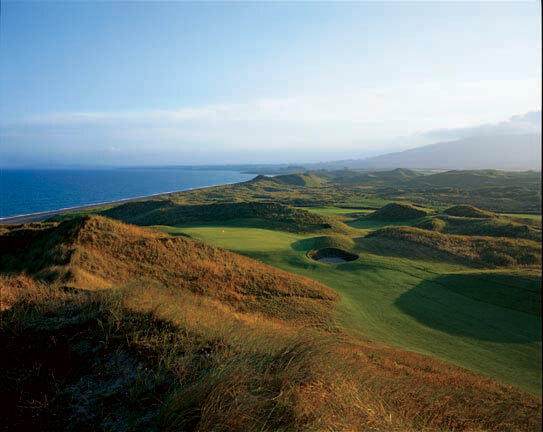 Ranked 14th in the British Isles, it is located on Ireland’s East Coast about 40 miles south of Dublin. The layout boasts three of the world’s best holes (par-four 7th, par-five 13th, and par-three 14th) and a healthy supporting cast to test the world’s finest players. You will also find several bunkers reinforced by railroad ties a la some of the older Scottish tracks. The course is set on a sandbank of dunes and is anything but tedious as it is unspoiled with nothing but gorgeous vistas. It may well be the last great links course ever built in Ireland and would make for a splendid Open site. By the way, Tiger Woods is the course record-holder with a mere 67. Dublin’s Portmarnock, a classic links built on land originally owned by the whiskey distiller John Jameson, should host an Open Championship because the peninsula on which it sits, tucked between the Velvet Strand and Baldoyle Bay, evokes the primordial linksland of St Andrews. And it was praised by no less than Bernard Darwin, who called it “a good, long, bold course, with plenty of natural features”—his highest compliment. And it would bring the Open to Dublin, whose people have proven their resilience again and again by nurturing a culture that takes life seriously, forging an attitude that congeals in that wondrous Irish social space, the pub, where all pretensions dissolve. And it was the home course—literally, because he was raised on the grounds—of the greatest of all Irish amateur golfers, Joe Carr, who won three British Amateurs and clusters of Irish championships, captained two Walker Cup teams, and was the first Irish Captain of the R&A. And because Portmarnock needs a graceful way to shed its men-only policy, which it clings to with the stubborn tenacity that has served the Irish well in many instances but is imprudent here. Negotiating with the R&A for an Open would let the members off the hook by allowing them to insist that abandoning their policy was a reluctant concession undertaken only so the club could venerate Carr’s memory. In 1933, 73 years after the inaugural Open Championship at Prestwick, R&A officials scouted a noble Welsh course and recommended alterations for possible inclusion in the Open rota. WW II interrupted, and decades later Royal Porthcawl (above) patiently awaits its invitation. 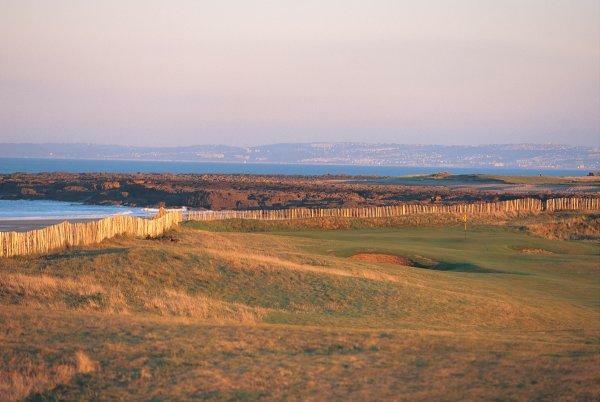 No stranger to major tournaments, the course routing encompasses every direction and thus the sea is visible from each hole; competitors deal with its windy, variable wrath on this exposed jut of land on Wales’ southwestern coast. Architect Tom Doak thinks it a “more likely prospect for really severe weather than any of the championship links except Turnberry.” And really, don’t we watch The Open to see great players twist and turn in the elements? Wicked slopes and deep pot bunkers protect greens and fairways alike. Strong closing holes add tense drama; unforgiving gorse will swallow poorly calculated drives on 18. Blame panoramic views and prevailing gusts off Swansea Bay for that distraction. The Senior Open arrives here in 2014. A trial run, perhaps, before the younger chaps have a go? When planning a trip for a golf student’s 50th birthday party, I had read glowing reviews of Kingsbarns, a relatively new course on the ocean seven miles from St. Andrews. While it may not be steeped in history like St. Andrews, it’s high on everyone’s list as one of the most beautiful golf settings in the world. You don’t need a camera at the Old Course—at least not after the obligatory first-tee photo with the clubhouse in the background—but you do at Kingsbarns, for nearly every hole: All 18 greens and 18 tees offer a view, usually memorable, of the North Sea and a generally rocky tidal coastline. Yet what is most striking is the design, the marriage of the layout to a gently sloping piece of land flawless. The finishing hole leaves a downhill lie on the second shot across the burn to a two-level green, providing great action for viewers, comfortably nestled in at beautiful clubhouse. Kingsbarns combines the rolling terrain and scenic views of Turnberry with the linksy charms of the Old Course. Good thing I put it on our itinerary. Royal Aberdeen (left) has existed on the edge of the city of Aberdeen, on the edge of the North Sea, and on the edge of hosting an Open Championship for the past 150 years. The sixth oldest golf club in the world hosted the 2005 Senior Open Championship in 2005 and last year, the Walker Cup. There is no doubt that the silky swells of Aberdeen’s front nine are among the very best links holes in existence. But with painstaking husbandry and several hole redesigns, the back nine lengthens and balances the course to make it the consummate golfing experience. Bernard Darwin wrote that Royal Aberdeen’s Balgownie course, “represented a huge gap in my golfing education…. much more than a good golf course, a noble links.” As Royal Aberdeen has evolved, especially over the past 10 years, as an Open Championship venue it would be a natural selection! What do you need for an Open Championship venue? A links course more than 7,000 yards long, preferably one that has hosted important professional events before. Ample room for spectators and all the circus tents that accompany major golf events. Parking nearby. And hotels for the players and staff to stay in. These requirements rule out 90% of all possible courses, but not Dundonald Links in Ayrshire, Scotland. Dundonald ticks all these boxes plus one: it’s a great golf course. This Kyle Phillips-designed track, which sits just across the railway tracks from Western Gailes GC, would provide a good, stern test for today’s pros. Plenty of length, wonderfully challenging green complexes and putting surfaces, lots of variety, and just enough gorse to make those frantic searches for stray balls dramatic. I think Dundonald is one of the most underrated courses in Scotland. The R&A should consider it. The official purpose of the Open Championship is, of course, to identify the year’s champion golfer. But like every major sporting event—the Olympics, Ryder Cup, World Cup—a salutary byproduct is flattering exposure for the venue and its surroundings. And this writer can attest that there’s no more eye-popping promo on the planet than to arrive via helicopter at Old Head Golf Links (above), in Kinsale, Ireland. Talk about an opening sequence for television coverage: a two-mile-long peninsula with 300-foot cliffs jutting into the Atlantic. Okay, it’s true that Old Head’s dramatic topography also may disqualify it as an Open site: The property’s 220 acres—180 of which are occupied by the course, most of the remaining 40 by ecologically sensitive terrain—probably couldn’t support the corporate hospitality and other traffic integral to the festivities. Still, Old Head, first opened in 1997, could counterbalance the game’s occasionally hidebound image. Kinsale, Ireland’s foodie capital, would do the same on the culinary front. Returning recently to Western Gailes Golf Club (above) after a 15-year absence, I was reminded that this wonderful course has all the charms of the famous Open venues, just on a slightly more modest scale. It has the uniquely British private-club atmosphere of a Muirfield, and, celebrating its 116th anniversary this year, a healthy dose of tradition; but it’s not nearly as snooty even if the clubhouse is well stocked with its own bounty of trophies. It has the adjacent railroad line of a Prestwick, the Firth of Clyde-side locale of a Turnberry and Troon, the dunes of a St. George’s, and the natural provenance of a St. Andrews. Plus it boasts links golf at its best, especially the 5th through 13th holes, running along the shore and the sandy, grass-covered mounds. Changing direction at 14 for the hard slog home guarantees a different wind and the need to hitch up one’s pants (quite possibly under rainwear) and find another gear. Y’know what? Let the R&A pass on Western Gailes; the rest of us shouldn’t. Decent responses, some excellent golf courses suggested. Just a couple of things – is there really ‘a sleepy town called Aberdeenshire’? Surely that is the county where Cruden Bay is located. Secondly, nothing against E-Club, Portmarnock and Old Head, but they are not in Britain, which would seem to disqualify them. Playing the Open there would be akin to the US Open being held in Canada …. You’re correct about Aberdeenshire; Cruden Bay’s town address is Peterhead. As for the courses in Ireland, we made the very conscious decision to include Irish courses as possible venues for a British Open if for no other reason than it might help repair some of the “troubles” over the years. And as you note, they are pretty fair courses. As for the U.S. Open being held in Canada, we’ll send that to the USGA for consideration. i seem to have read somewhere that the open was first held at prestwick, and was held there for several years before going to st. andrews. Dunbar; Gullane No 1 – which is right next to Muirfield; Southerness in Dumfries and Galloway; Machrihanish is an absolute gem! Brancaster in Norfolk. If you insist on including Irish courses then I would add Waterville; Doonbeg; and Ballybunion. Thanks for your consideration. @JAF – enjoyed your reply – your heart is in the right place when looking to smooth over the “troubles” – will look forward to reading the USGA’s response when they read the suggestion to move ‘Up North’!!! LOL!! BTW, played Crail Balcomie last month in teeming rain – great shame, as it is a lovely spot, with a splendid course and very friendly folks, but maybe a little short for the Open if the wind doesn’t blow (I mean the course, not the people..)? You’re right. The Open Championship was held at Prestwick from its first staging, in 1860, until 1872 (no championship in 1871), before going to St. Andrews in 1873. Of course, St. Andrews is still on the rota while Prestwick hasn’t hosted since 1925. Too bad. There are quite a few courses in Scotland about which you could say the same thing. The Open, like all big events, has become as much about the services as it is the golf–hotels, parking, concessions, and so on. And don’t forget that many of these lovely courses are too short for modern equipment and can’t be lengthened. The USGA’s experiment next year at Merion may, I fear, be the last gasp for similar layouts. But well done USGA for going to such a great course as Merion. Tradition is worth as much, if not more, than a level par winning score. Birkdale are actually tougher than the Open venue, West Lancs, Hillside and S&A, they just can’t fit the stands in sadly! Now on our Courses to Play list however!